When growing indoors hydroponically you will need to monitor the temperatures and humidity levels in your grow room 24/7 and the easiest way to do this is with a temp dial that records the highest and lowest levels reached in a 24 hour period. 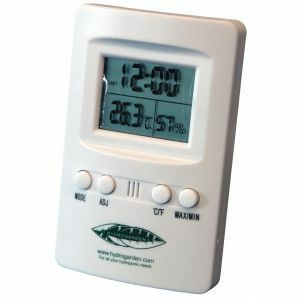 This digital Thermometer and Hygrometer permanently displays your grow room or greenhouse temperatures and humidity levels on the same large LCD screen. This is a very handy item to have to provide you with an accurate reading of your levels daily and it also records the highest and lowest levels reached that can be displayed with the push of a button. This unit can also display the temperature in Celsius or Fahrenheit and it can be wall mounted or surface mounted.